In an increasingly connected digital world, it’s not enough for our children to simply use technology. They must be ready for a society where social media, free exchange of information, and all other aspects of the Internet integrate themselves into day-to-day living. Our children must learn to become responsible citizens of this digital world. Educators are responsible to teach them how to use resources effectively for the benefit of themselves, their community and the world. In response to this challenge, Swiss International Scientific Dubai School (SiSD) is the first UAE school to integrate Digital Citizenship education into the curriculum from G1 to G12. We have decided to adapt the award-winning curriculum from Common Sense Media, a recognized non-profit organization that provides educators, parents and students with the resources they need to harness the power of technology for learning and life. “Through the introduction of this curriculum, we will instill the values, skills, and support system necessary for all our students to thrive in this digital era” says Amir Yazdanpanah, Head of Technology Innovation at SiSD. Students will be armed with skills and knowledge necessary to take ownership of their digital lives. SiSD will also provide parents with tips and family activities, guidelines to support classroom teaching. As a result, parents and teachers will in turn be better equipped with the training and materials needed to help teach their students. Digital Citizenship is broken down into units that are tied to different grade bands. For example, in the K-2 band, students are taught the most basic of digital citizenship skills, such as searching the web safely, protecting one’s privacy, and writing good emails. 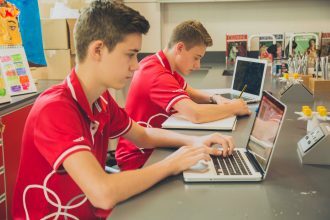 Much further down the road, Grades 6-8 students explore concepts like identity theft, cyberbullying, and respect for others’ creative work. SISD recommends that parents register on the Common Sense Media web site where they can access valuable researched backed articles, app. and book reviews related to the youth interaction with digital world.